I’ve had a number of conversations recently about selecting gameplay options in games. Character builds, unit selection, upgrades, anything that provides you tools or options or effectiveness (read: not cosmetic stuff). These things usually have a cost associated with them, and occasionally dependencies, and then an overall effect or suite of options in-game for you to then use. From chatting with people, I’ve discovered that a lot of people look at the cost to effectiveness comparison alone. Essentially, it’s an “I put points/resources in, get results out” evaluation. If that exchange looks good, then great! We’ll take this option and move forward. What ultimately results from this kind of selection process is a fairly haphazard end result. Most people will take this a step further and ask whether the choice they’re making fits into an overall plan before making the selection. Does this talent mesh with the other talents I’ve taken? Does this unit work well with the other units I’ve chosen, or offer me options I wouldn’t have with my currently-chosen selection? Having an overall strategy is good, and refines the selection process quite a bit. It’s also where most people seem to stop in their evaluation. There’s a step further that I like to take when making selections. Evaluating options based on the choices you’ve already made is strong, but can be stronger if you take into account the choices you HAVEN’T made. An option might provide you with tools and effectiveness at a fair price, but still not be the best, or even a terribly good choice. It comes down to what you’re giving up by making that choice. 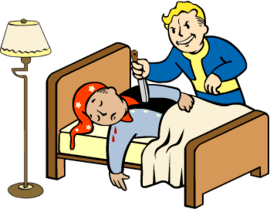 To use Fallout 4 as an example, the Ninja and Mister Sandman perks both cost a point and provide similar benefits– raising your sneak attack damage. Assuming you’re good at getting sneak attacks, both appear to be good options. However, it’s notable that Mister Sandman requires that you be using silenced weapons, whereas Ninja does not. Assuming you can’t take both, you’re cutting out the possibility of having your laser weapons benefit (which can’t be silenced) if you choose the Mister Sandman perk. Ninja, however, allows the use of all weapons. Choosing Mister Sandman has the opportunity cost of not benefiting your laser weapons– not necessarily noticable if you opt out of using laser weapons entirely, but it does provide a limitation, or at least makes you less than optimal if you do choose to use a laser weapon. 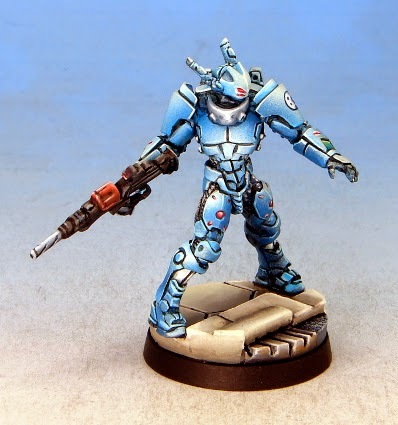 To use a different example, in Infinity, most factions have a “basic” Heavy Infantry, a sturdy unit in a suit of power armor who can take more damage than a basic unit, has good stats (and usually equipment) and costs in the 40ish point range. At the same time, the game has basic line infantry, who tend to have very basic weapons and low stats and cost in the 10 point range. A question that is generally worth asking when picking one or the other is “what is more valuable to me, a 40-point powerhouse or four 10-point basic units?” This is going to depend on what else is in the force– a strong 40-point unit is good at being a spearhead but only contributes one action to the pool every turn, whereas four basic units can’t fill the spearhead role but provide four actions to the pool every turn. If you need more actions, or if you need a strong spearhead, it can make a big difference. Given the point costs involved, if you’re taking a 40-point basic heavy infantry unit, you’re probably not also taking a 60- or 70-point elite heavy infantry unit, which may be significantly more powerful or flexible. 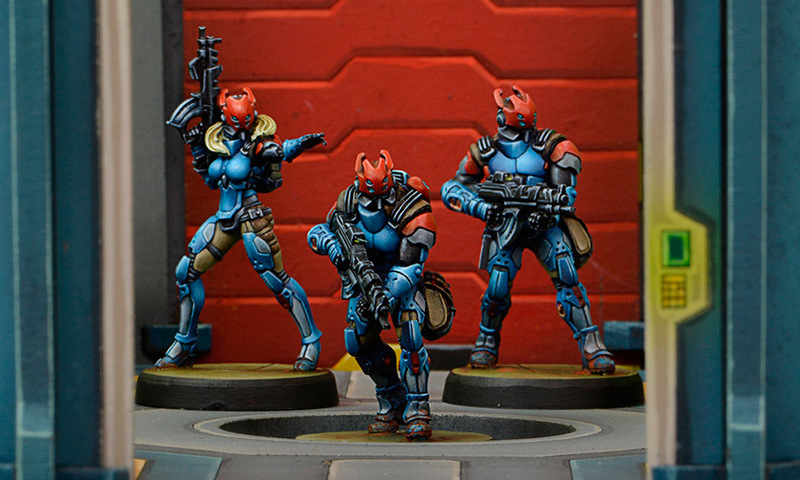 Many Infinity players tend to opt out of taking the “basic” heavy infantry, and instead either make room for the more expensive elites or downgrade to cheaper, more plentiful units. Despite being fairly priced for its benefits, the “basic” heavy infantry unit represents too high of an opportunity cost to make the cut; it’s not better than four basic units, whereas the 70-point elite *is* better than its equivalent value in basic units. This kind of evaluation often seems to strike a nerve with game communities. As a friend of mine put it, many people seem to view game design as a kind of mysterious black magic, and assume that everything is “meant” to be as it is. Having done it, I don’t view it as any sort of unknown quantity, and have no problem evaluating things at, essentially, a high-tier design level. Factoring opportunity cost into a choice can be, at some level, a design critique– as a player, I’m saying that even though this choice LOOKS reasonable, it actually isn’t due to a flaw or oversight in the game’s high-level design. Something that appears to be a valid choice turns out not to be if you zoom out to a broader view. Sometimes a choice is simply outclassed by a similar choice that offers the same benefits. Sometimes a choice fills a role or solves a problem that didn’t need solving, or is redundant with other options that offer more flexibility. The critique of this sort of thought process is often an accusation of “gaming the system”, or excessively optimizing, or powergaming. In miniatures games, an epithet thrown around is that a certain kind of play is a “Win At All Costs” (WAAC) sort of player, who is willing to make any sort of sacrifice in order to win the game, whether that means having an interesting force on the table to play, providing their opponent with a fun game, or expressing originality in their gameplay. Often, this kind of optimization is closely linked to “netdecking” or “netlisting”, where a (usually top tier) player has determined the “best” selection of options and the community tends to believe that deviating too much from that established selection is simply a bad choice, and thus many people make those specific selections and no others. I tend to feel like making these kind of opportunity cost evaluations is not only important to a game, but keeps it healthy. I don’t much care for Warhammer 40k, because it lacks even a remote semblance of balance between choices– some factions are simply better than others, and within factions some unit choices are flatly superior in every way to others. The community (and, indeed, the game’s designers) sharply criticize strategic evaluation as a “WAAC” behavior, which is considered “overly competitive” or “toxic”. As a result, the game balance is very poor. It’s one of the reasons I like Infinity, because there are very, very few units in the game that don’t hold up to a high-level opportunity cost evaluation; nearly every choice in the game can be a valid one in the right circumstances, and while not every list is created equal, almost every unit has a place in a list somewhere. Not only is nothing so bad it can’t be played on the table effectively, very few things are bad enough not to be the *best* choice in a list somewhere. This kind of evaluation leads to better game design, too. Years of WoW’s talent trees revealed that many talents were simply never the best choice, in any build, and what appeared to be a plethora of options was actually just a series of traps to catch those not optimizing properly, and the gap between an optimized build and a non-optimal one was very wide. While the removal of talent trees from WoW was met with criticism (because it offered “fewer choices”), it improved the overall quality of the game because while there were numerically fewer overall choices, there were a larger number of meaningful choices with multiple valid options. A lot of the gap between a good player and an excellent player is their willingness to zoom out and take a bigger, more comprehensive look at their options. Despite sounding a lot like a hyper-optimization-focused player in Infinity, I play an extremely wide selection of the units in the game, and by doing that kind of high-level evaluation, I’ve found ways to make unbeloved pieces not simply playable, but shine, often in unexpected ways.